Greetings, friends!! My internet has been out and our lights flickering all evening. It’s a wee bit stormy around here and more winds are threatening to blow through. I was so worried I wasn’t going to be able to get this post scheduled — yay me for not doing this earlier in the day but that’s me, the procrastinator! But luckily, the internet popped on a moment ago so I’m scrambling to get this scheduled while I can. So if you see this post Friday, you’ll know I succeeded even if it is only partially finished, hahah! First of all, thank you so much to Lindsay of White Buffalo Styling Co. for hosting a great tour of homes this week and including me in it! 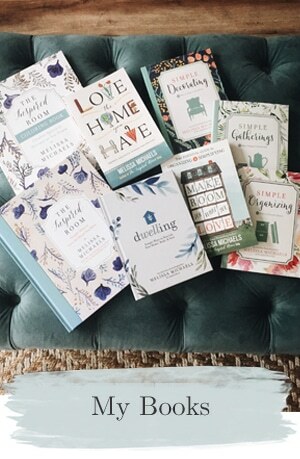 If you are just joining in, be sure to head over to her place to catch up on all the links to homes! This is the second tour I am a part of for my house this Christmas, but while I only have one house to share :) I took SO many photos of different angles of rooms and close ups recently that you’ll get another peek around today. I saved a whole bunch of new photos just for this tour! You’ll see a few things maybe you missed or another side of a room you didn’t really get to look at in the last post. When you are done with this tour, free to go back through the first tour from earlier this week, too, if you’d like! Also, while these tours are fun to enjoy in their best form, I’m sure you’ll all enjoy seeing what happened in the days following, so after the tours be sure to check out the aftermath post here. 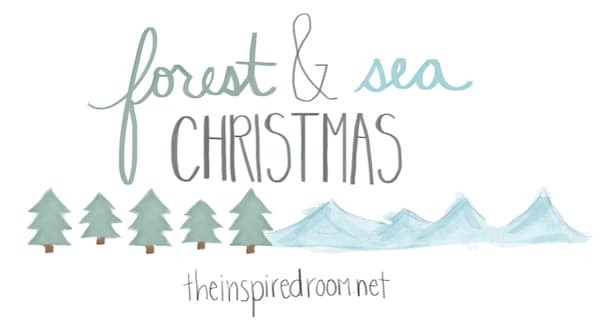 In my dream world, I was going to decorate the bedrooms and front porch for Christmas by today. YEAH RIGHT! Dreamer. The reality was I had so many obligations this week with book writing and Christmas events and just keeping up with life, I haven’t been able to do much more around the house or get it photographed. (You’ll see a tiny peek of my office, though). I’ve discovered on all the tours that I am one of the only bloggers on the face of the internet that doesn’t have Hunter rain boots by the door filled with fresh greenery. But what I do have on my front porch, where the Hunter boots WOULD be (had I received the memo), I have … PUMPKINS. OK. Now that we got that confession out of the way, let’s carry on with the tour. Jack’s been watching out the window, eagerly awaiting your return. He LOVES when people visit! In our gathering room (the room in between the entry and the dining room, formerly known as our living room heheheh) we have birch branches we collected this year from a little forested area near our house. I put them in a big tall planter (sorry, I somehow didn’t get a picture of the whole thing) and I thought it would be fun to put ornaments on it for Christmas. 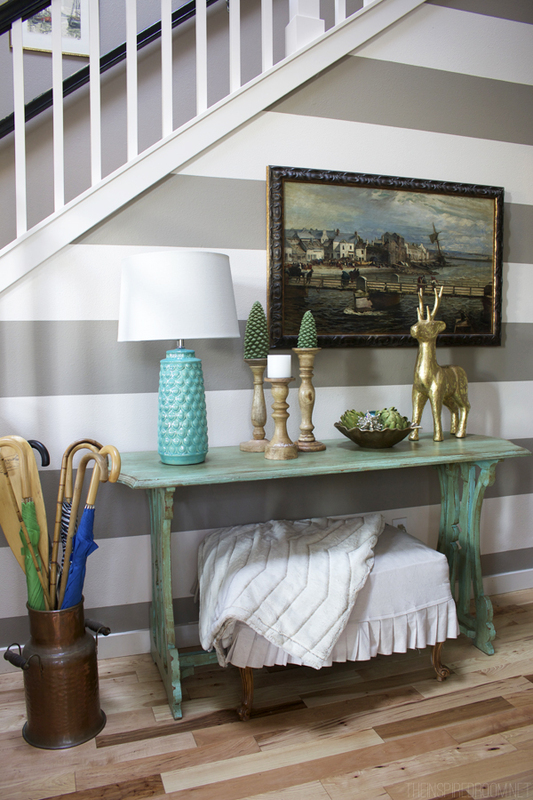 It’s amazing what a simple thing like a fresh coat of paint can do for an old table, too. We left the leaves natural because we still really like it that way! :). While we only add a touch or two of Christmas here and there around the house, I feel like it’s enough that it feels festive. And not so much that I feel overwhelmed by it all. I guess I’m more of a winter decorator. Candles and fresh greenery are my favorites! At night and especially for dinner parties, we light all the candles and it starts to feel magical. 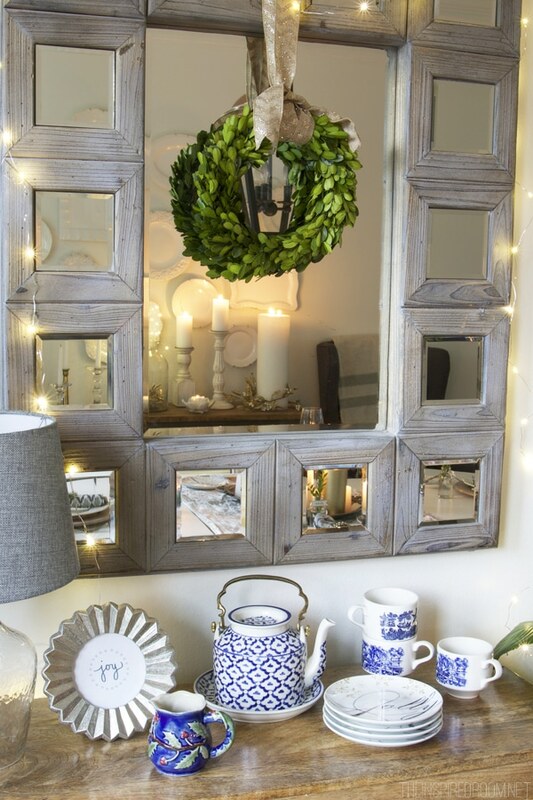 Little string lights around the mirrors and in glass jars add little dots of holiday sparkle. The paper whites smell wonderful! I love having lots of plants and greenery around. And I love how the mirror reflects all the flickering candles around the room. 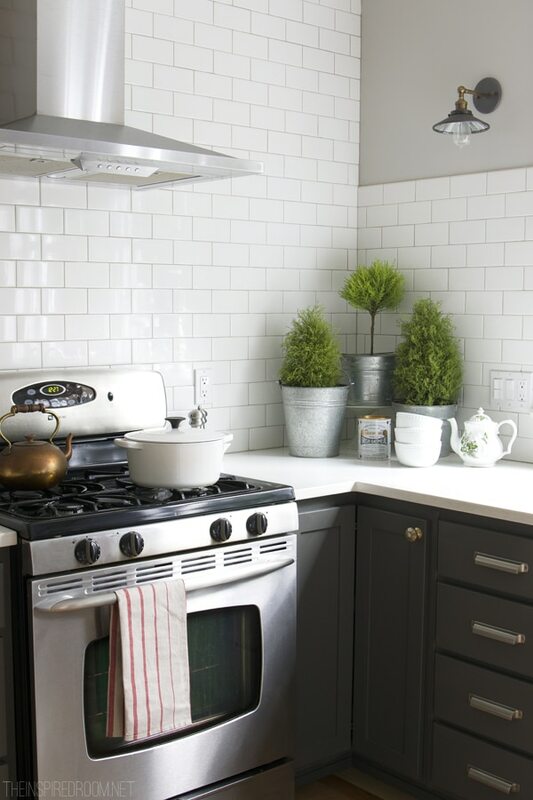 Little trees in galvanized buckets are so simple, but they are yearly favorite. I get them at Lowe’s or Trader Joes, and I get the buckets at our local farm store. I’m wondering how long it’s going to take before Jack & Lily (our one and three year old doodle pups) will discover that we have a tree full of adorable animal ornaments just waiting to be devoured. So far they haven’t even noticed, but in past years Jack has destroyed his fair share of ornaments. We are keeping our fingers crossed that they are more civilized this year :). 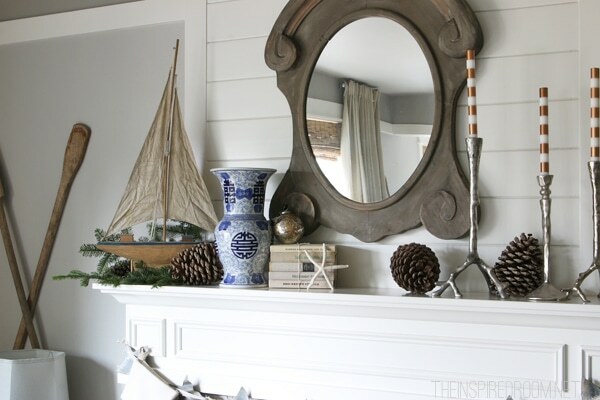 I was working with Pottery Barn this week on a post (you can see it here) and had the opportunity to restyle my mantel with a new banner, thus the different look of my fireplace in this photo. It was such a dark day when I was taking these photos, but I really love the sparkly Merry Christmas banner! 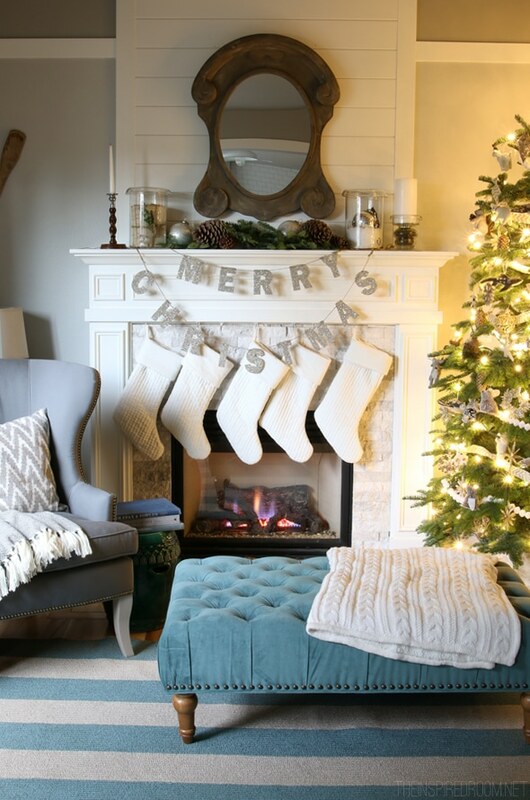 We’ve had the white quilted stockings for years! I also tried the Merry Christmas banner out in my office and love it in there too. As you can see, I moved the Nespresso to the office and it’s so fun having it within reach for those emergency coffee needs haha! I’m still loving it, you can find more details on the machine I have here, it’s called the Nespresso VertuoLine. You can find the post I wrote about it here. Thanks for visiting today, friends! I’m so glad you came by. The next stop on the tour is my friend Traci’s from Beneath My Heart, she has such a lovely home and is a real sweetheart, so go on over for a visit! 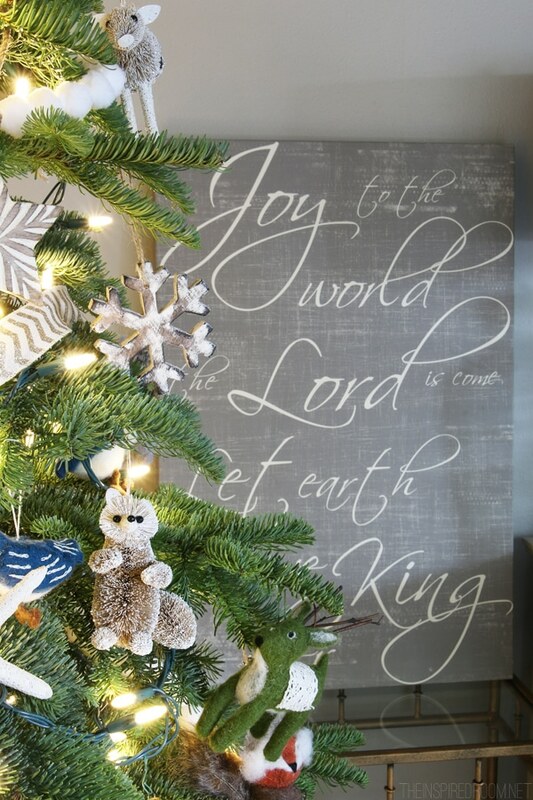 You can find more photos and part one of my Christmas House Tour here! 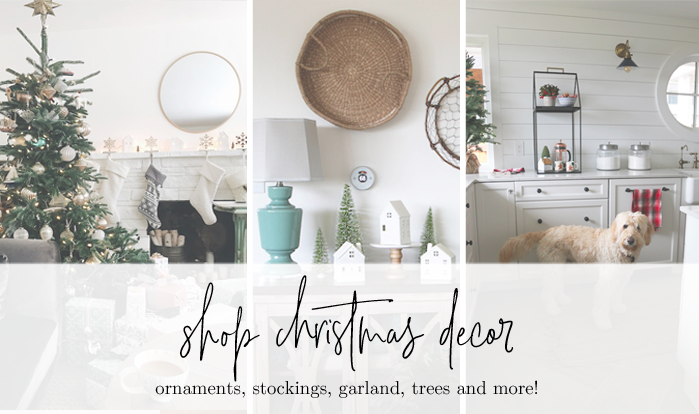 If you’re looking for a great wreath, Christmas tree, tree skirt, decorations or other seasonal item, we have an ADORABLE shop you can find by clicking HERE or the banner below. 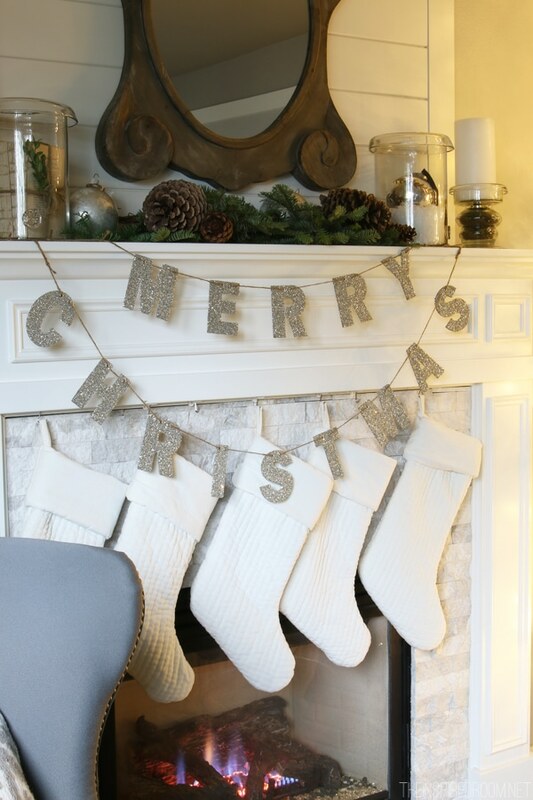 For those of you who have asked, here is how I hang garland, wreath and stockings without nails! Such an absolutely stunning Christmas tour. Jack & Lily are so cute. Your house is so light filled, what a happy place :) What flooring do you have? Is it older woods floors that you have refinished with no stain on it? They are really beautiful. And I really love your Christmas house, everything is fabulous! What a gorgeous home you have love the decor! Jack is super cute:) Where did you purchase the short cabinet with glass doors? I love this along with all your furnishings. Thanks for sharing! I love the Hunter boot observation. I would, though, because I need to be different. 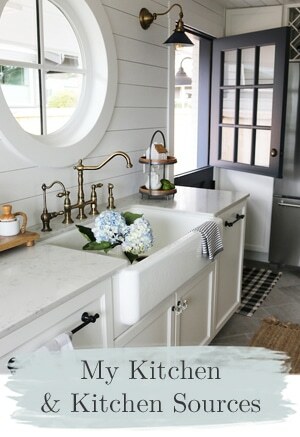 Just yesterday, I insisted we get white kitchen appliances for our project house! HA — my husband-equiv. color shamed me in front of the IKEA guy! 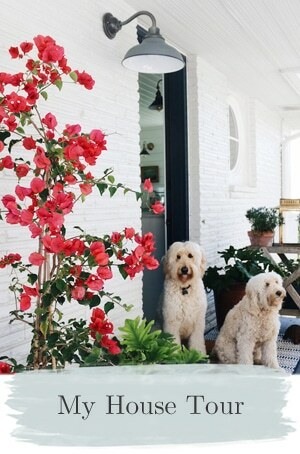 But I digress, as I often do — love your house, + your dog is awesome! Thank you Kay! Merry Christmas! 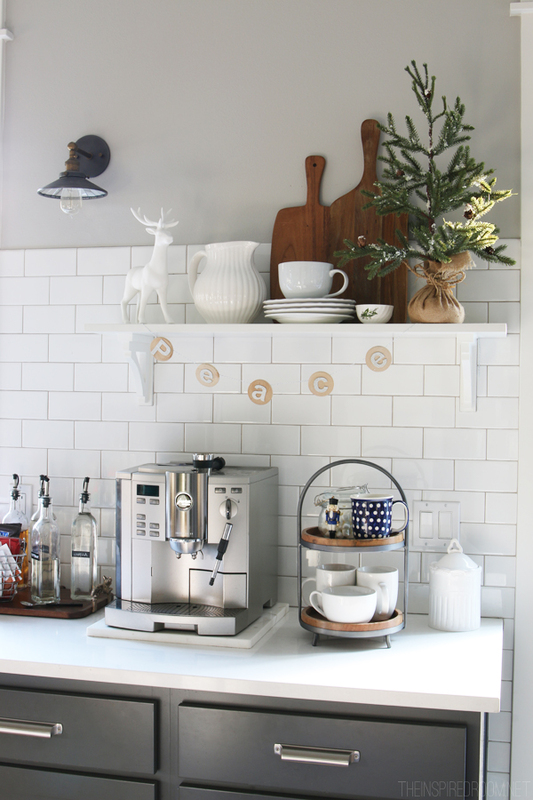 Love your simple decorating! I’m EXACTLY like you. If I have too much out then I feel overwhelmed!!! 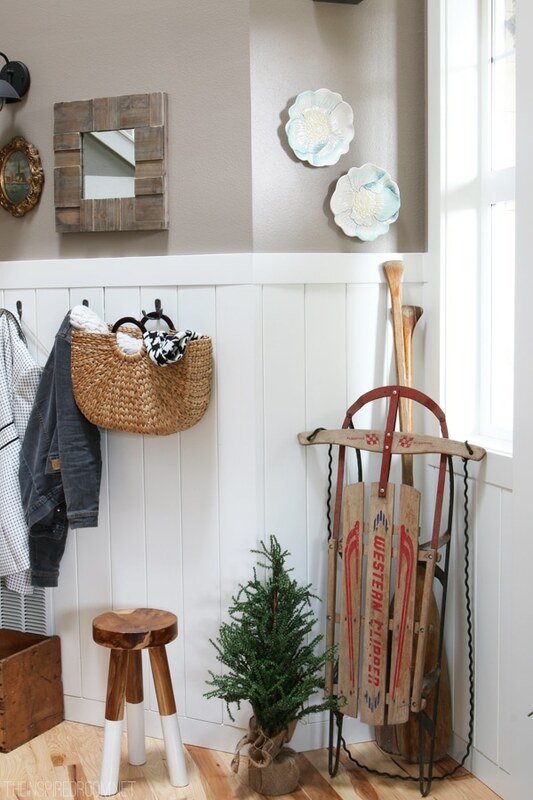 I love the idea of decorating for winter with the exclusion of the Christmas tree! I’ve been so overwhelmed with all the excess that I’ve been known to take everything down dec 26th with not one sign of Christmas left. So if I follow a natural way then It will be more apt to stay! So please keep the natural decor ideas coming for this reader lol. 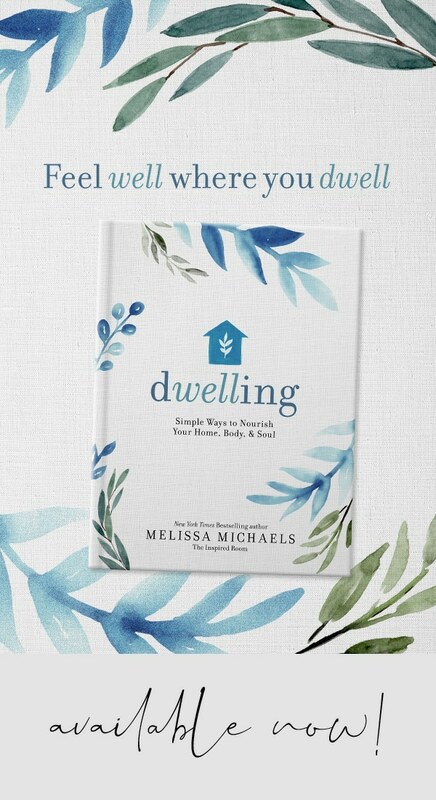 Thanks for your inspiration Melissa! Jen in Boise. Ps LOVE your home! Thank you so much, Jennifer! :-D! Merry Christmas!! Everything looks so pretty and elegant with small touches here and there. Real greenery is the best whether or not it’s tucked into Hunter rain boots lol. I think our pups would be friends! Mario sits right by the front window and looks for visitors or neighbors to walk by most of the day. He’s pretty good with the tree, but he’s eating my wrapping paper! Jack and Lily would love to meet Mario, he sounds like their kind of pup! :-D Merry Christmas! 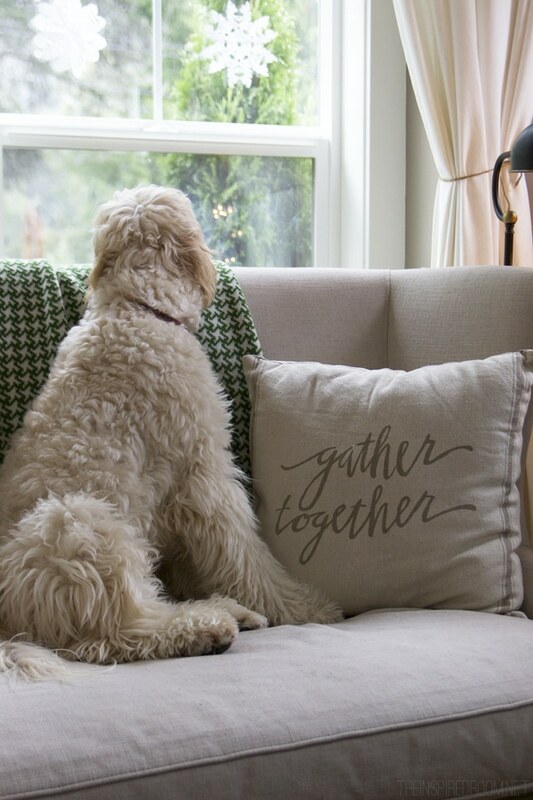 Just wondering if you would have a moment to tell me where I could get the pillow that says “gather together” on it? Love it! It was a wild and windy night in Seattle too! Glad you had power. Loved your Christmas tour. 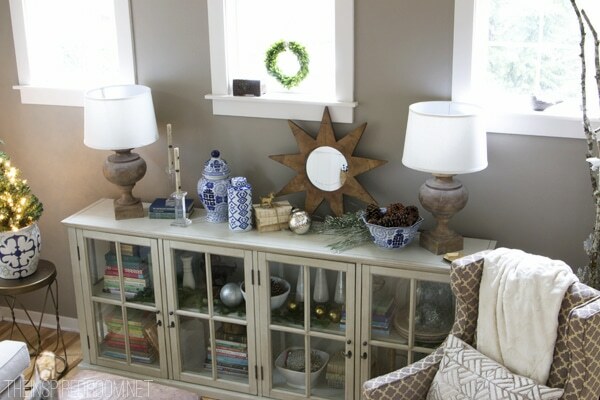 I love your shallow glass fronted cabinets in the living room (the one with the wooden star mirror on top) and I remember you mentioned them in your blog some time ago. Where did you get them? 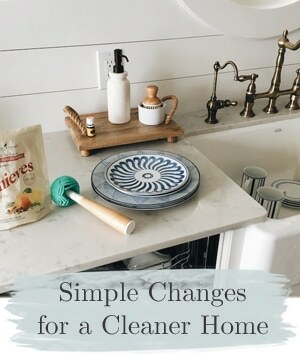 I’m on a long range hunt for small space solutions for a down size move five or six years away… gathering good storage solutions now along with five years of purging ought to do the trick! I got both of those cabinets at Restoration Hardware. After downsizing from the big house, I’m finally getting myself the right furniture for this house and getting organized. I don’t think you can prepare too early hahah! Very beautiful! 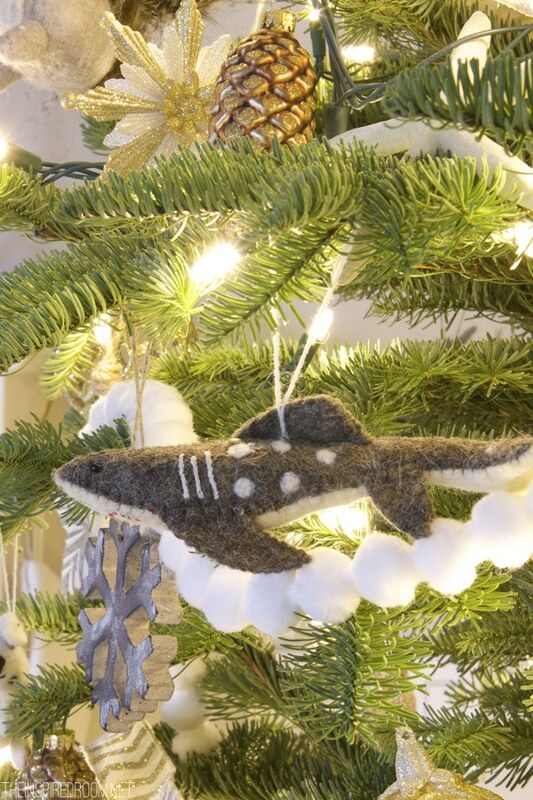 Love your ‘West Coast” holiday feel. Take care in this nasty weather you’ve been having! Merry Christmas! Your home is beautiful (AS ALWAYS)! And I get quite the giggle about your dogs every time you post about them. They are so darn cute! Everything looks so pretty and I always love a tour of your home. Gorgeous. Wild storm, wasn’t it? We had to sleep downstairs since we are surrounded by tress but they remained upright. I’ve used lots of battery powered little lights this year & left them glowing. When the power went out we weren’t plunged into pitch black. 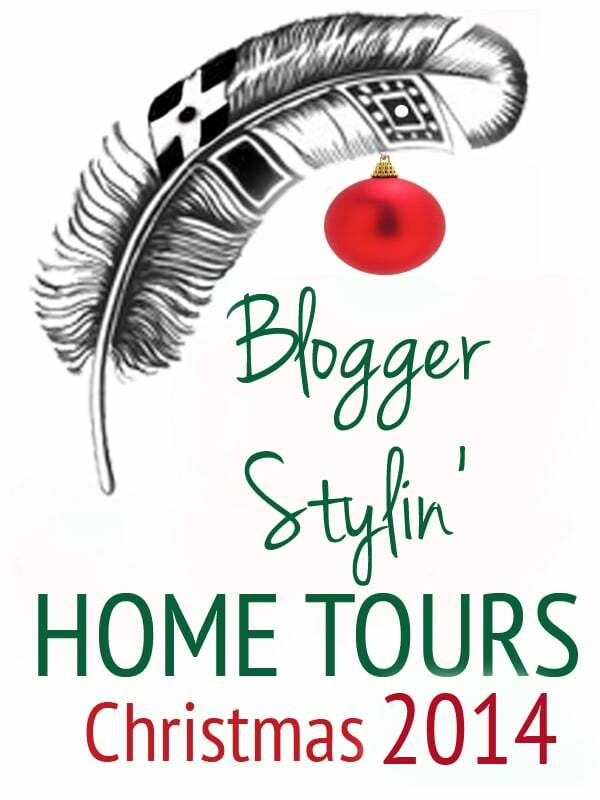 Your home looks lovely – thanks for the Christmas tour! It has such a peaceful flow throughout and Jack and Lily really enhance it all…. That’s too funny about the Hunter boots, I know with the wind we’ve had lately if I had some sitting on the front porch they would of ended up blown over to the neighbors. 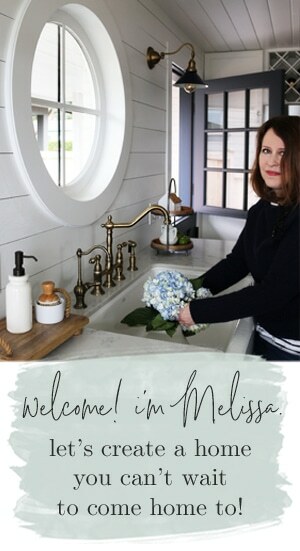 OH my goodness, Melissa, your home is just gorgeous! 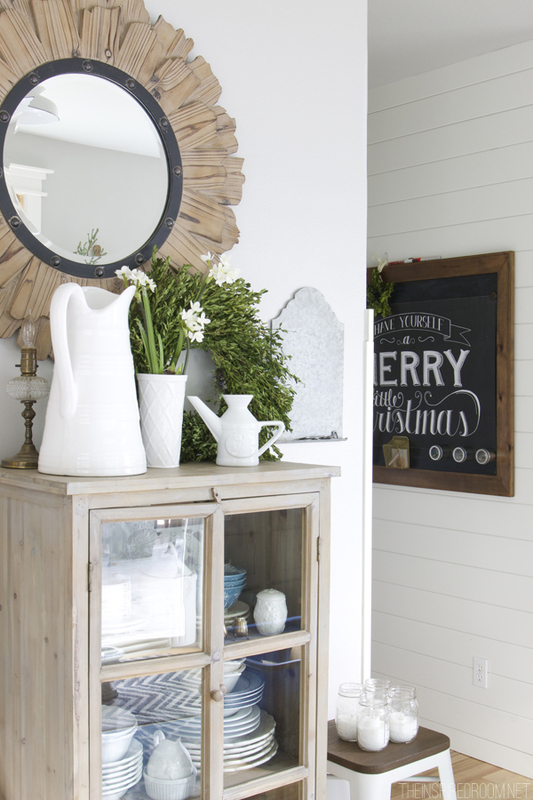 It is so homey and inviting and I love how you’ve infused a touch of Christmas into every little corner! Your floors are still my all-time favorite floors. Thank you for joining in! It’s an honor to have you! Thanks for having me Lindsay! I’m honored to be joining you lovely ladies. So pretty! I love how pulled together it looks, but still super comfy and inviting! Yes! That’s just what I think, LOVE IT! Thanks for coming by! Love your home. So warm and cozy. 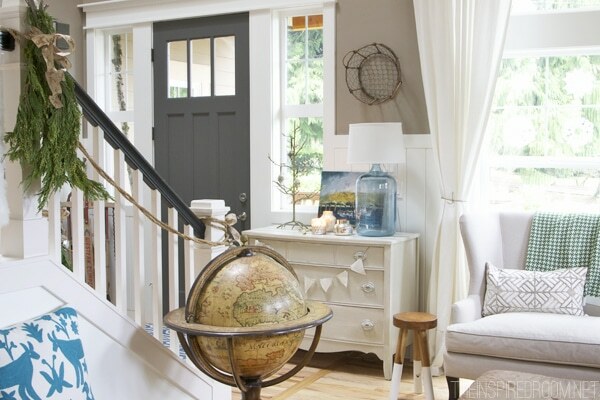 What color paint is on your entry walls? Hi, Melissa. It was a wild and stormy night in Port Orchard too! Lights flickered but stayed on. I love your color choices, textiles, pillows and candles. 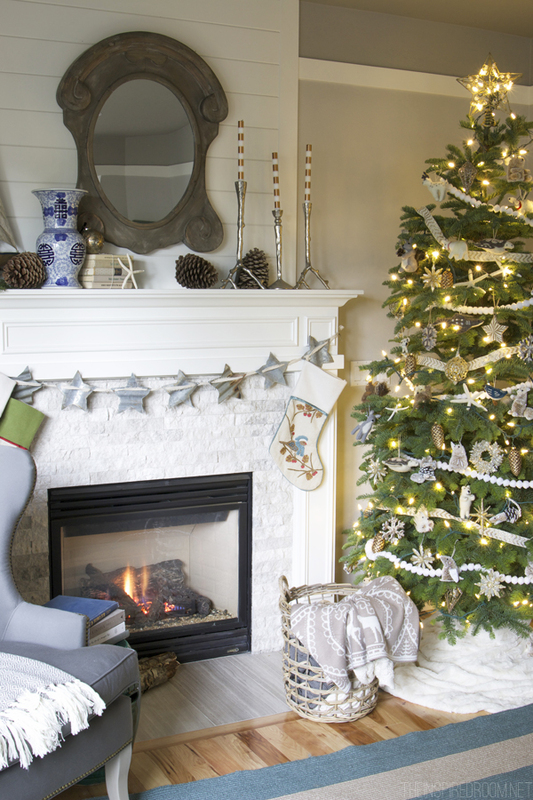 The real greenery and branches really make it feel like a Northwest Christmas at your home. Give Jack and Lily hugs for us. Our Bichon Shiloh wishes you a Merry Christmas! I have to be honest…the hunter boots comment totally endeared you to me even more. I don’t have them either so that makes two of us!!! Haha. And I love every detail. It’s so fresh and clean and simple. Well done girl. Bwhahaha! I’m not sure how I missed the memo! I think I would want to wear the boots anyway and then I would end up with pine needles stuck in my socks. xoxo Merry Christmas to you, friend. Beautiful! 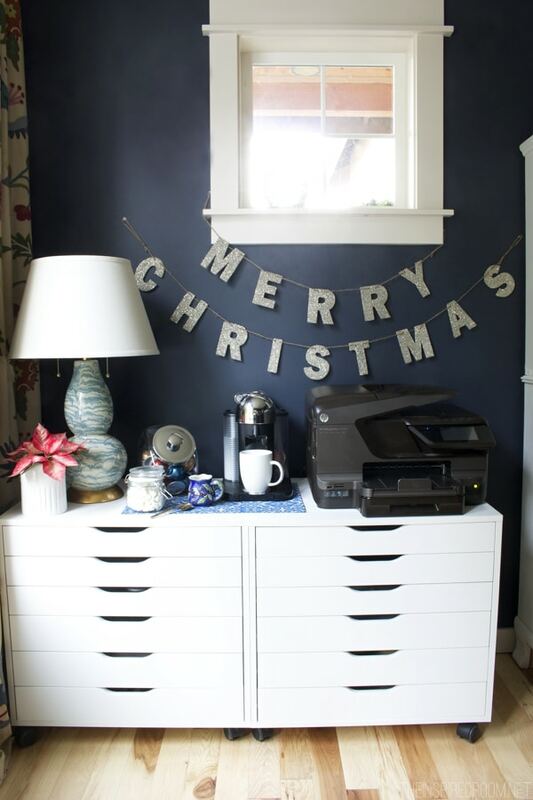 I especially love the Merry Christmas banner against the dark blue wall – it just pops! Hi Melissa, I love the picture over the green table under your stairs. Have you mentioned that in a post? I love the light in it. Thanks for your tours. Happy Christmas! Hi Marilyn! I’m sure I’ve mentioned it as some point, but it was a fun story! I actually found it tucked away in a storage room in our old house (which you can see here: https://theinspiredroom.net/my-old-english-tudor-house/) when we were in the process of buying the house! We paid the sellers’ $100 for it and had it taken to an antique dealer who told us it’s an 18th century impressionist era painter who was a friend of Monet’s! How cool is that?! God blesses in awesome ways, sometimes. Heading over now to check out your old house. Thanks for the quick response. Yes, isn’t that the craziest story? I feel so blessed to have it. It’s gorgeous. Merry Christmas! Thank you for not doing the boots filled with stuff. I personally don’t like the look and since everyone is doing it, it’s getting old…fast. I’m with you on missing the Hunter boots memo! ;) Every time I stop by your house I fall more in love–if that’s even possible!! It’s all FABULOUS!!! your home is gorgeous! 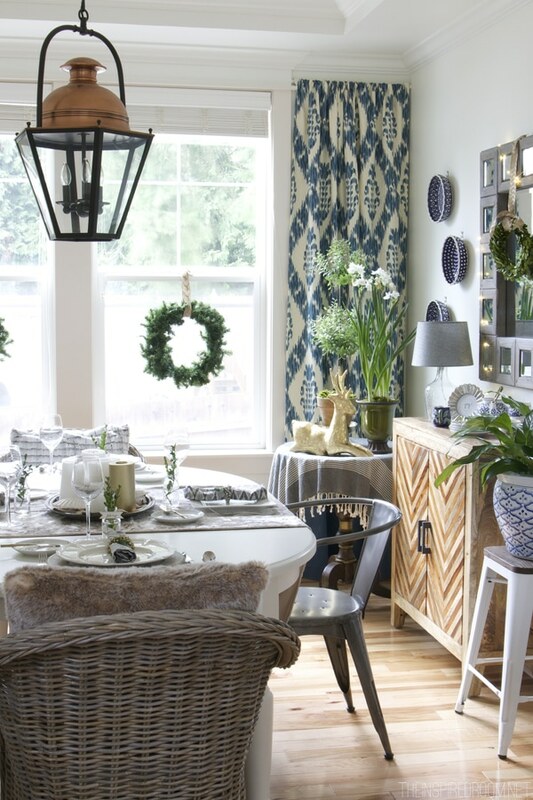 love your dining room so much, love the star garland and your entry! Melissa, I’m especially smitten with your dining room and I LOVE the little corner with the paperwhites and the golden deer with your lovely drapes behind them. It’s fascinating to see all the change in your home, just this year. The one thing I notice the most is the harmonious color movement from room to room, yet without feeling totally color themed. I think it was in Part 1 of the tour that I immediately loved the change in the front door. 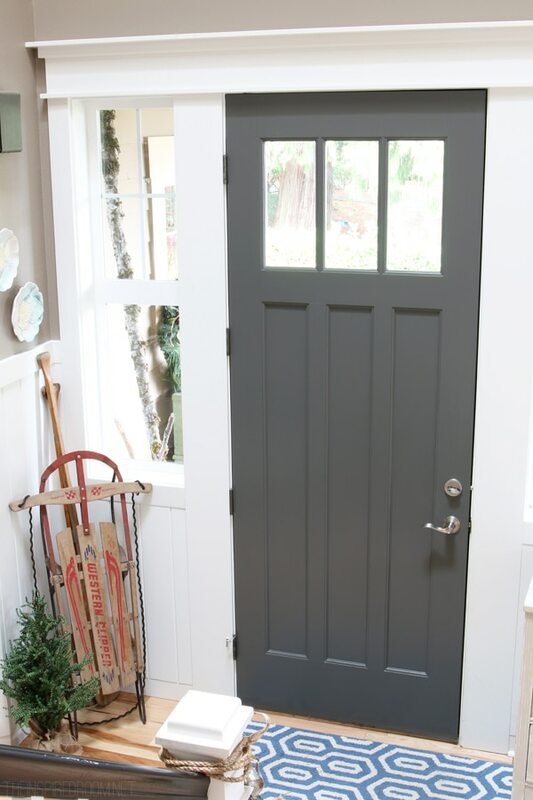 I know you shared it some time ago, but that initial welcoming photo with the door was breath-taking. Thank you Diane, you always notice such detail and it makes me happy. You are a kindred spirit. Much love and Merry Christmas to you! NO hunter boots here either!! Your home is beautiful and I love that Jack is looking for visitors! 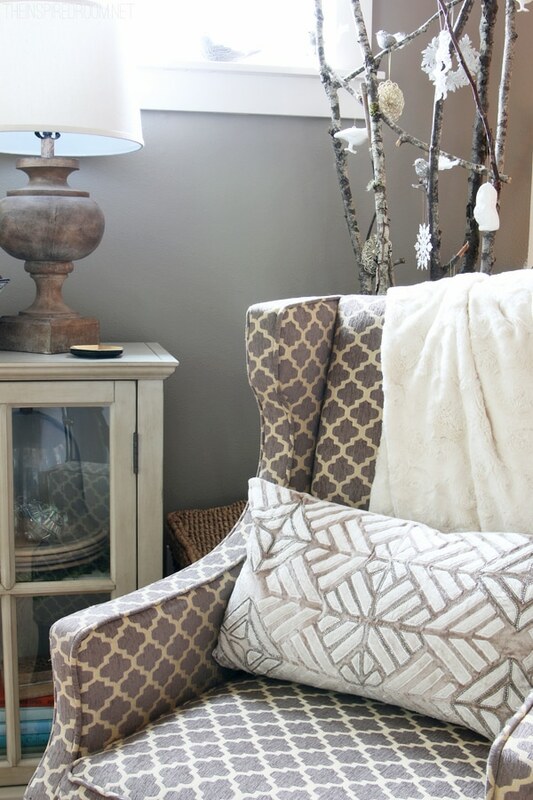 Love it all and I may have to buy that ottoman, love the color! Thanks so much Debbie! xo Merry Christmas! 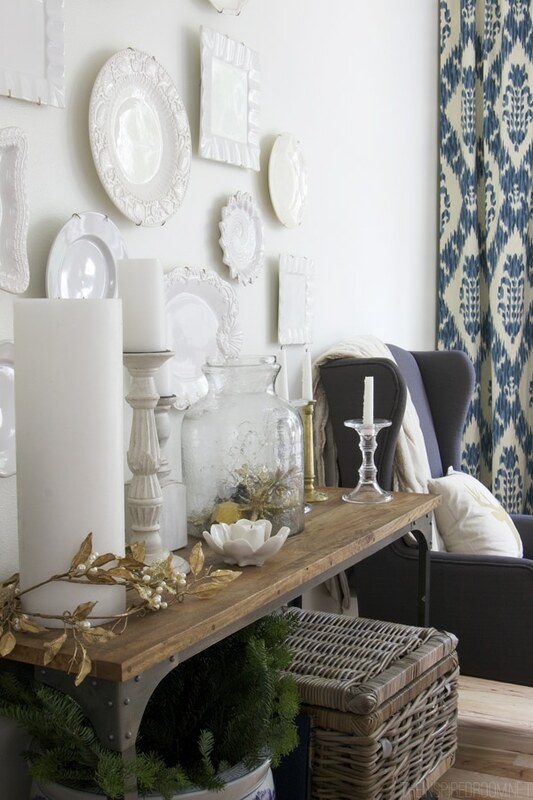 I have always loved your home and decor Melissa, but I am really crushing on it lately. 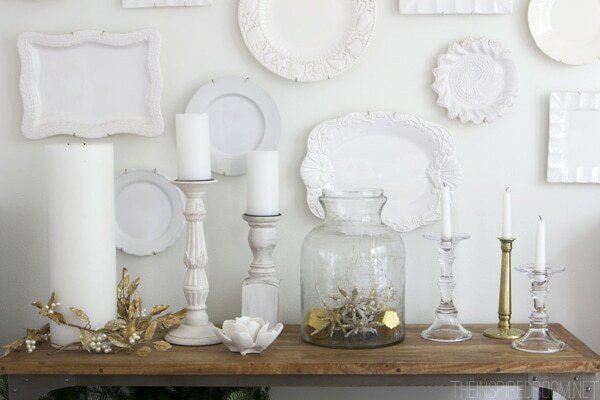 I went through your old Christmas archives that served as a huge inspiration to my decor this year. 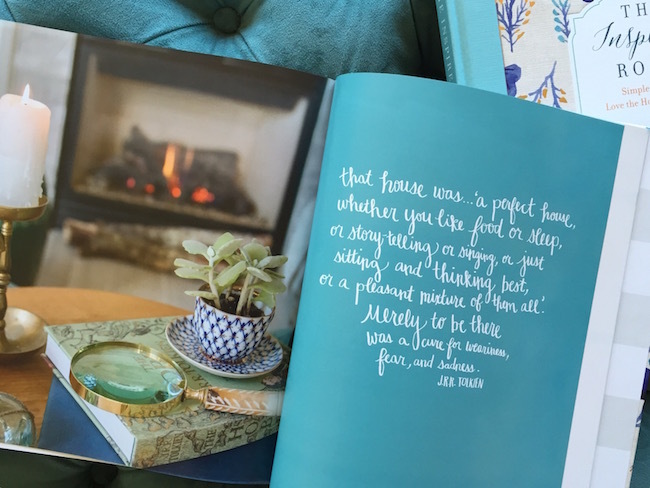 Your home is timeless, personal, and warm…something I so crave for my own home. 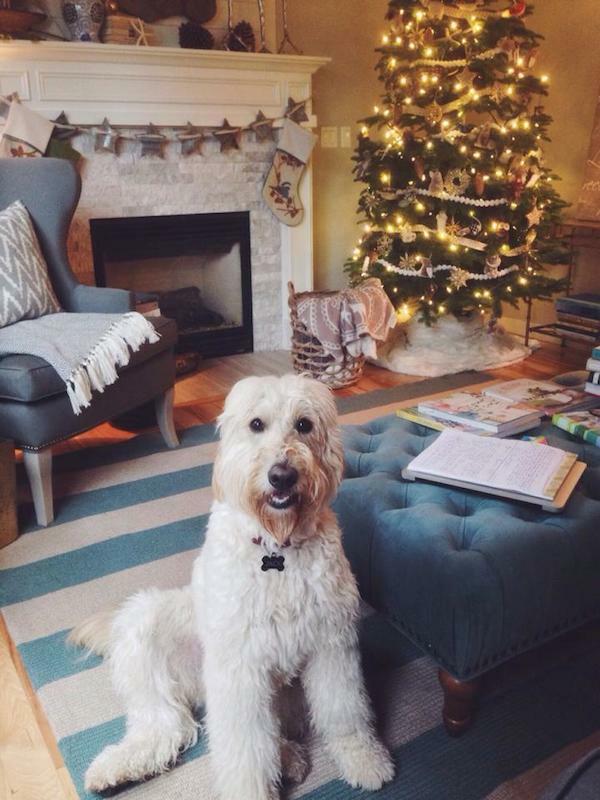 Your home is so beautiful… Love the simple use of color and all of the decorations are outstanding… Especially the shaggy 4 legged one named Jack!! Love it! 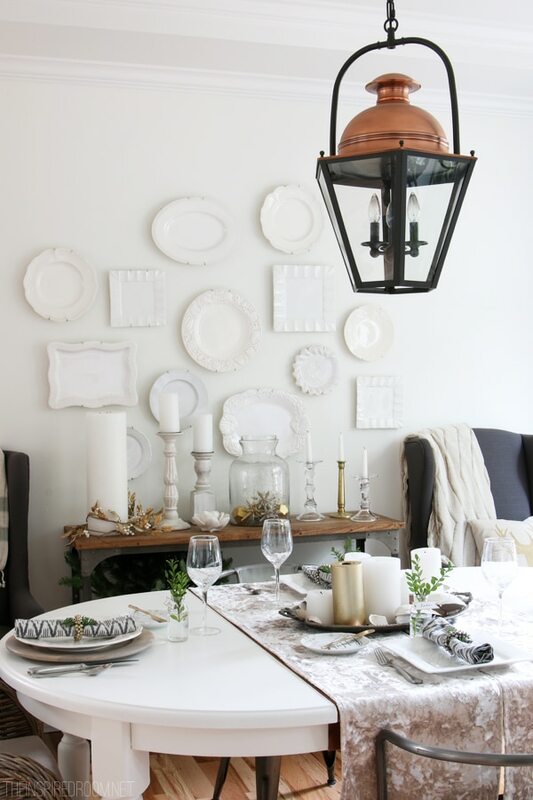 Where did you find the blue and white pie plates on your dining room wall? One word….BEAUTIFUL! Don’t feel left out Melissa because I too, do not have a pair of Hunter rain boots filled with greenery at my front door neither…lol! To be honest, did not know that it was a design perquisite for Christmas decorating…lol! Thanks for sharing and have a blessed Christmas! the last year or so. He’s 4 months old and loves gobbling up things too…thus a tiny tree this year so he won’t be tempted to devour the ornaments! Hi, your home is so inviting and comfy. 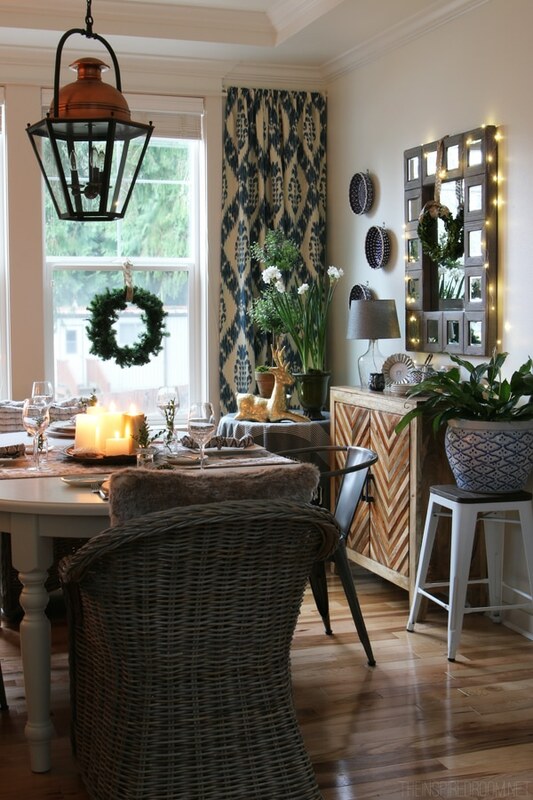 I am especially drawn to the mirror with the lights around it, in the dining room. Was that a project I missed? If not, do you remember where you found it? Thanks and have a blessed Christmas. Loved the decorations and the way you decorated the space! Such a beautiful home, especially the living room. Ha! AMEN to that. :-) Merry Christmas! By the way, you are not the only with happily nestled pumpkins outdoors and a Christmas tree indoors. I just removed mine to make room for my wintry display even though all is still unusually green and warmish here in the Alps. If our porches were on the same street our neighbours might be wondering how did we both miss the other memo about it being time to change out the seasonal welcome… and yes, I do remove a ‘crunchy’ wreath just before spring. That’s why I’m keeping an eye out for a lovely basket like you have this year on your front door so i could switch dry pine for tulips before the next memo even goes out at all! And as I also have a Nespresso machine in my office, I will be able to sip’n’search quite cosily online when the weather finally remembers it’s no longer autumn and blankets everything in white to match my front porch display. 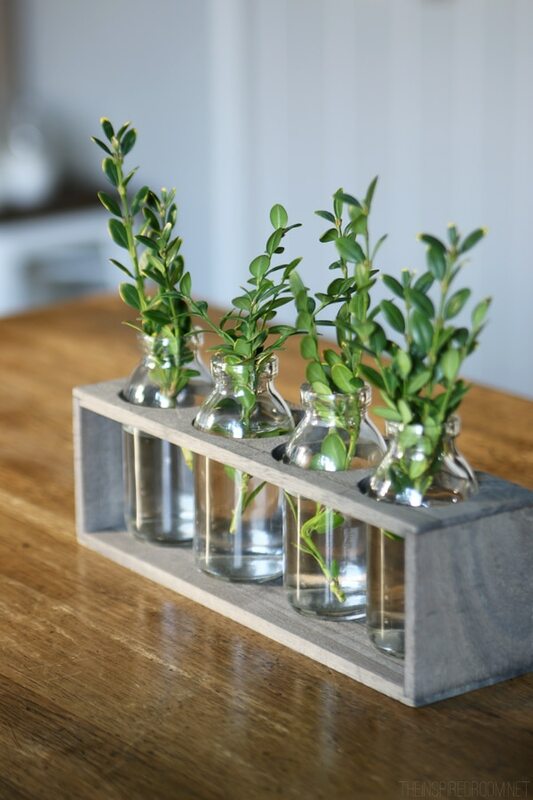 What a great idea you had with the cedar branches and they look wonderful with white decorations. 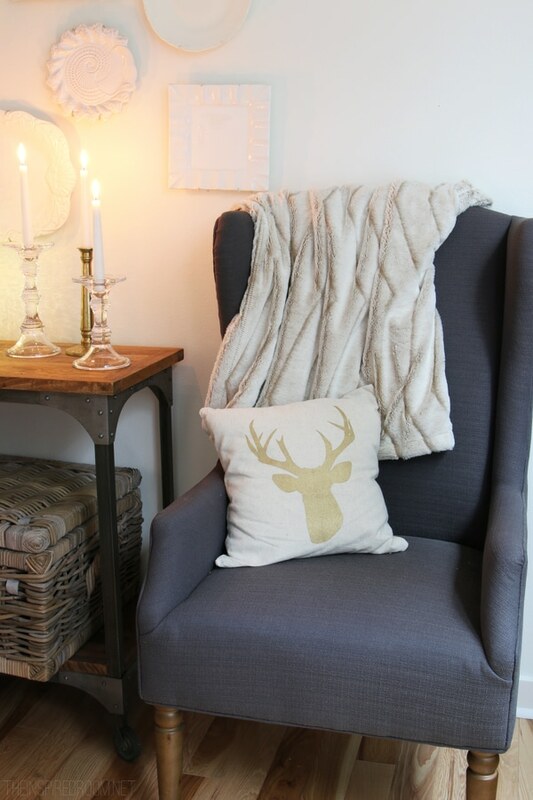 I also really like your gold silhouetted reindeer pillow with the pale coloured fur wrap/plaid/blanket. 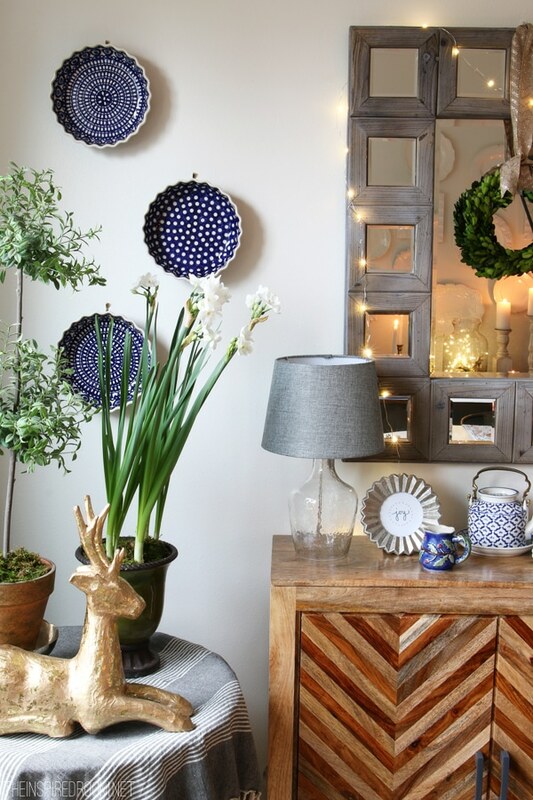 It goes so well with the the cosy, bright, modern yet organic atmosphere you’ve created for the holidays. 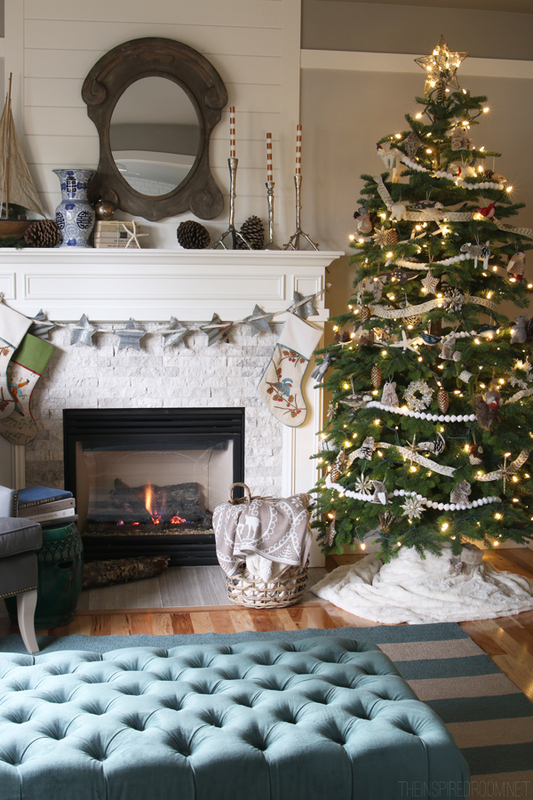 I sincerely hope that in all the chaotic and numerous things that need to be done this Christmas, you get the chance to enjoy and savor the lovely home your inspirations and creativity have made. Joyeux Noel. I love how you decorate your home! Is so cozy especially with the candles lit up! I am in bed sick with the flu and just found your blog! What “great medicine” it has been for me:) Love your home! Could you tell me what kind of prep and paint your husband used to paint your dining table?